Playwright George Bernard Shaw said that “the single biggest problem in communication is the illusion that it has taken place.” As a playwright, Shaw knew the importance of really communicating with the audience, making sure that the concepts, emotions and thoughts you want to impart are what the audience actually receives. This is just as crucial for a financial advisor as it is for a playwright. You want to help your clients and empower them to take charge of their retirement planning; this can be difficult if you are not effectively communicating with them. Without effective communication, clients will not understand the information that the advisor is presenting to them and if they don’t understand, they will not be comfortable taking action on the advisor’s advice. The first key to engaging and educating clients is active listening which we discussed in a prior post. The second key is effective communication. Here we look at five ways to communicate more effectively with your clients. Begin with Your Client’s Concerns – If you began your client meeting as a good listener, you will have a good idea of the questions and concerns your client will want you to address. If possible, start with these concerns. This will convey to your client that you have heard and understand what is important to them and that you are making it a priority. If you address your client’s most pressing questions at the beginning, you will also free them to focus on other topics afterward. Be Clear – In communicating or illustrating solutions or scenarios to your client, be clear about what you are showing them and why. Tell them what you hope to show them during the meeting. If you are changing different variables, tell them which and why you picked those. Part of being clear means not using industry jargon or terms they may not understand. Sure, things like the glide path, sequence of returns risk, turnover rates and expense ratios may be of interest to your clients but don’t assume they know these terms or concepts, put them into layman’s terms that they can understand. Be Concise – Rambling explanations or repeating the same points over and over will tire and possible confuse your client. Be concise in your explanations, neither you nor your clients have time for long explanations when a clear concise one will do. Ask Questions – Remember that retirement planning should be a dialog between client and advisor. Pause occasionally during the meeting to gauge whether or not your client understands what you are communicating and whether or not they have any questions. Try to use open-ended questions that invite response. Instead of “Do you have any questions?” try “What questions do you have?” If they seem hesitant, inquire about why. Do not hurry the process. Remember that the responsibility for good communication rests with the speaker, not the listener. If you want your clients to understand what you are telling them, be sure you are communicating effectively. Effective communication builds understanding, which liberates your clients to make informed decisions and motivates them to take action. 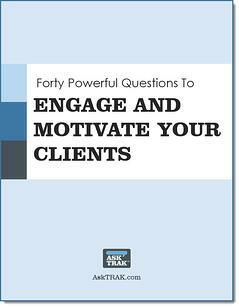 Looking for help asking good questions to engage your clients? Download our list of 40 great questions!